Adjustable holder with Micro-USB connector. 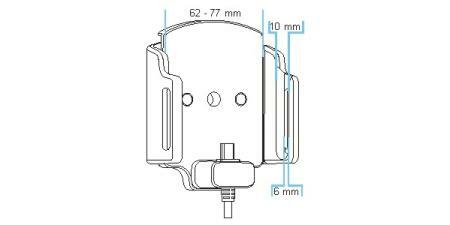 Fits for devices with and without skin with the following dimensions: Width: 62-77 mm, Thickness: 6-10 mm. 2,1A charger. 12/24V. With tilt swivel. Keep your phone in a holder when on the road and you will always have it within easy sight and reach. 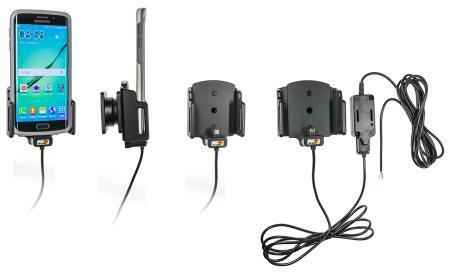 The active holder for fixed installation is to be connected inside the dashboard, this gives a discreet, neat installation without cables hanging over the interior! The adjustable holder fits for devices with and without skin with the following dimensions: Width: 62-77 mm, Thickness: 6-10 mm. Adjustable holders come in various sizes. Measure your device and compare with the holder specifications in order to make sure you have chosen the correct product (if you are using a skin: measure the device with the skin in place). You can choose to use the holder as an active holder for charging of your device only, or to connect an adapter to the Molex connector for additional features. 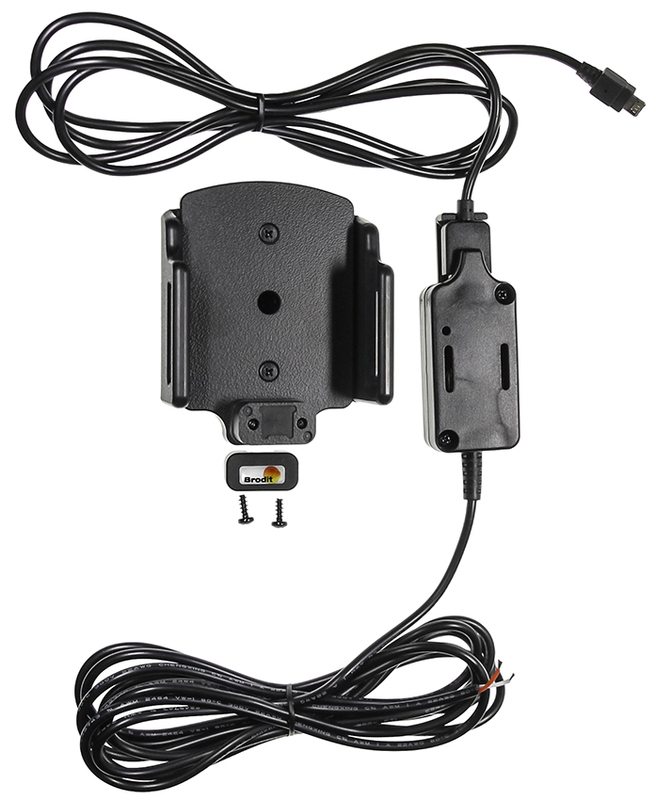 Then you can use the holder also for power supply of a GPS receiver of other own solutions (cannot be used for data communication or audio connection). The product is E-approved. Connect the power cable with a 2A fuse. Professional installation recommended. 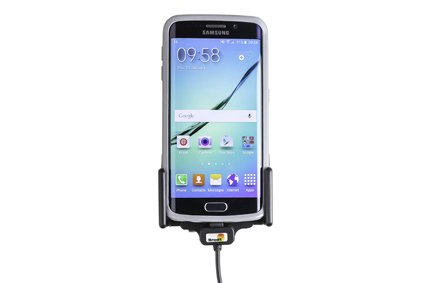 Before using the holder you need to confirm the charging cable is turned the right way (you can rotate it) and also set the holder's width so it suits your device, then your phone is held firmly in place in an upright position for maximum cellular reception. The holder has a neat and discreet design which blends well with the vehicle's interior. This product supports Qualcomm QC 2.0 quick charge (provided the device supports Qualcomm QC 2.0 quick charge). Read all of the instructions before attaching the holder. Important Note: Connect to a 2 A fuse holder and fuse inline with the Red wire close to the power source. Ensure the charger unit is securely mounted behind the dashboard in a well ventilated area! Route the power cable from the charger unit to the power supply source in the vehicle and connect as follows: 1. Connect the White wire to a Negative Ground connection of the vehicle or the vehicle chassis. 2. Connect the Red wire to a 12/24 Volt power supply in the vehicle that is controlled by the ignition switch of the vehicle. How to mount the holder: 1. 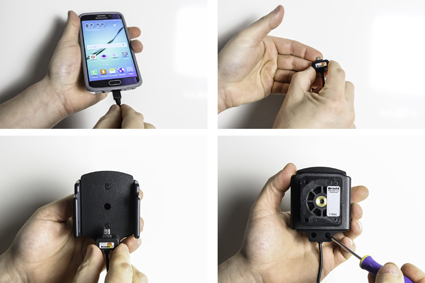 Use your phone to determine in what direction the charging connector should be placed in the holder. 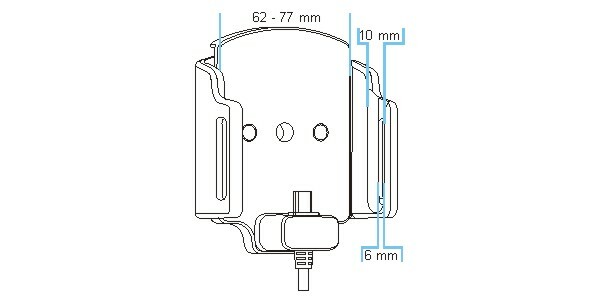 Place the charging connector into the locking block. Place the locking block onto its position on the front of the holder. Turn the holder around and screw the locking block into place using the enclosed screws. 2. To adjust the holder for your device: Loosen the screws on the front side of the holder, so the sides of the holders can be adjusted. Place the device in the holder and press the sides together so the device is firmly in place. Remove the device carefully. Tighten the screws on the front side of the holder. 3. 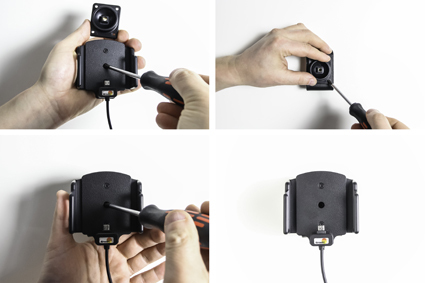 To install the holder: Loosen the screw in the center of the holder removing the tilt swivel attaching plate on the back. Screw the attaching plate onto desired position with the enclosed screws. Place the holder over the attaching plate. Screw a few turns on the screw, so the thread starts to pull. Pull the holder toward you and hold it slightly tensed, in the same time tighten the screw firm at first, then loosen it a bit so the holder is firmly in place, but still can be adjusted. 4. The holder is in place. 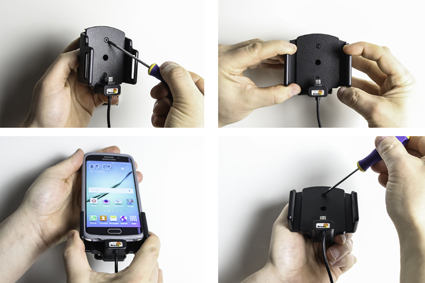 Attach your holder onto a ProClip!